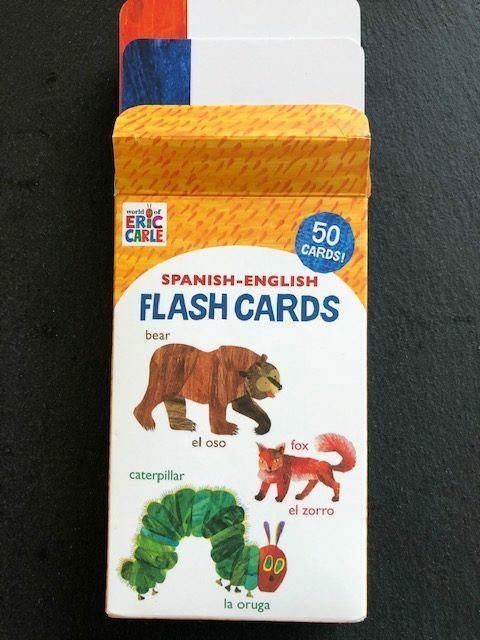 As a great fan of Eric Carle books, I was very excited to find some bilingual Spanish-English flashcards when I was browsing online. I ordered them in November, and they finally arrived last week! Well worth the wait however, and I thought I’d share some ideas I’ve had for using them. I’m sure you’ll have your own thoughts; please share them via the comments below! 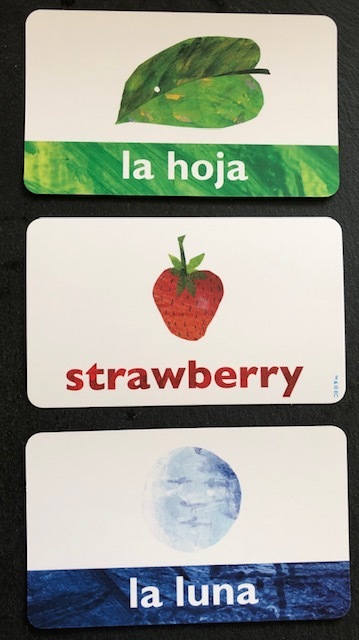 There are 50 cards in the pack featuring words from some of Eric Carle’s books including The Very Hungry Caterpillar / La Oruga Muy Hambrienta and Brown bear, What do you see? /Oso Pardo ¿qué ves? 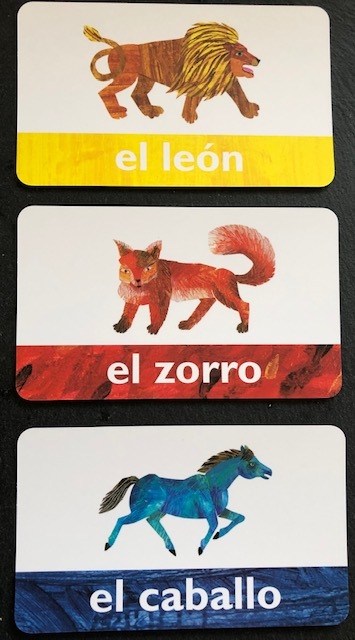 Each card is double sided with the word in English and an image on one side, and the word in Spanish (complete with definite article) and the same image on the other. It’s easy to distinguish the Spanish side from the English as the word is white in a coloured strip on the Spanish side, but in colour on the English side. *Learn new words by studying the cards and then testing yourself on the Spanish. *Pupils could work in pairs and take it in turns to say the word in Spanish. *Show the image and say the word. *Show a card – which story does it come from? You could start with one card and add another if necessary. perhaps you could award 3 points if the book is guessed after 1 card, decreasing the points the more cards are seen. *True or false – when looking at a particular story, show a card; is it in the story? Hay un una abeja en Oso Pardo ¿qué ves? ¿Verdad o mentira? Which book features all these animals? *By gender – this is fairly easy as the Spanish word is accompanied by the definite article, but ‘los globos’ may throw a spanner in the works for some. *Animate and inanimate / ¿animado o inanimado? – could lead to an interesting discussion about whether a leaf is alive or not! Is it dead the second it leaves the tree? *Manmade or natural / ¿artificial o natural?– not quite the same as the above! 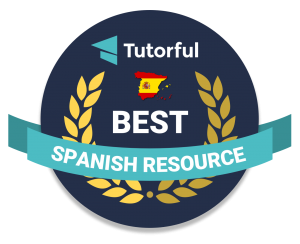 *words with an accent – reviewing why Spanish words have accents is always useful. *by phoneme – jirafa, oveja, pájaro, abeja, naranja, hoja would make a group for example. 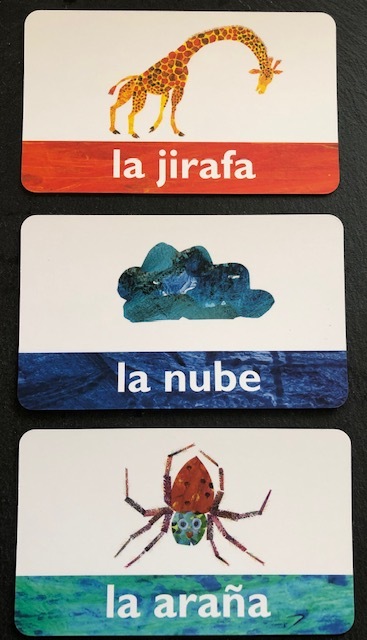 La jirafa pone la araña en la nube would be an example using the cards above. *alternatively choose more cards, six perhaps, and try to make up a sequence of sentences or even a short story. This would be a fun activity for Y6 who’ve learned how to manipulate verbs and are ready for a challenge preKS3! So these are just a few ideas I’ve noted down quickly that come to mind. Some can be done with a whole class, but most I envisage being done by pairs or small groups of children. I’ll let you know if I think of any more ideas, and I’m sure the children will soon devise their own games to play! Language World 2019 – the #LW2019 #sketchnotes! ¡Vámonos! The musings of Lisibo ©2019. All Rights Reserved.